Notes: As played by Earl Scruggs, recorded in 1958. Earl departed from his usual rolls in this short break, which he traded with the fiddle and dobro. Instead, he played most of the break in single-string style. It is exceedingly simple and stunningly effective. The song is in waltz time, with the capo on the first fret -- or perhaps Flatt and Scruggs tuned up their instruments a half step, as they tended to do in their earlier recordings. And, yes, the break comprises only 4 measures (thanks to Ken for asking!). Notes: "I Don't Love Nobody" was the precursor of Bill Monroe's "Santa Claus," according to Neil Rosenberg and Charles Wolfe's discography of Monroe, who learned it from an old-time fiddler in the region of northern Kentucky/southern Indiana. The tune itself seems to be an old-time version of the ragtime tune of the same name, the latter credited to Lew Sully. The ragtime song has appallingly racist lyrics, incidentally, which is perhaps not surprising given the era in which it was written. In any case, the instrumental version of "I Don't Love Nobody" is a wonderful Scruggs-style tune, and this is my version of it in the key of G. My version is based on Allen Shelton's, but includes some variations that you might find useful. Notes: A Great Gospel Jam tune! 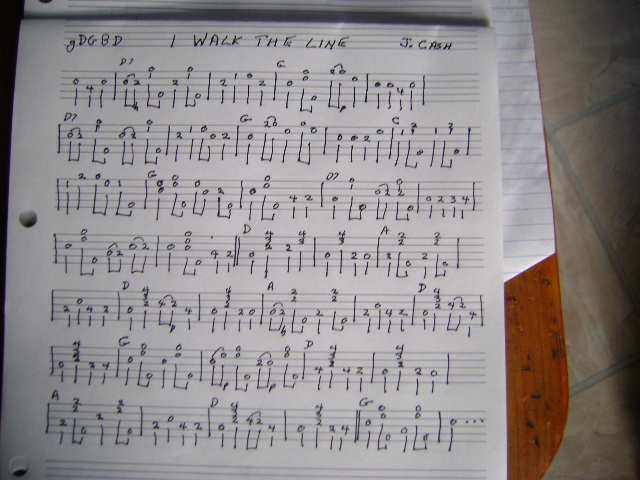 Notes: A very easy song with a 5-String Banjo Melody and Bluegrass Roll. It also includes lyrics, a 6-string guitar melody, and a simple drum line. Please rate it! Notes: Banjo tuned down 3 steps to EBEG#B -- I posted a version on http://soundcloud.com/rodeworks . Notes: 2-finger index lead, but should work for other styles. Pretty basic TAB, add your own embellishments or corrections. 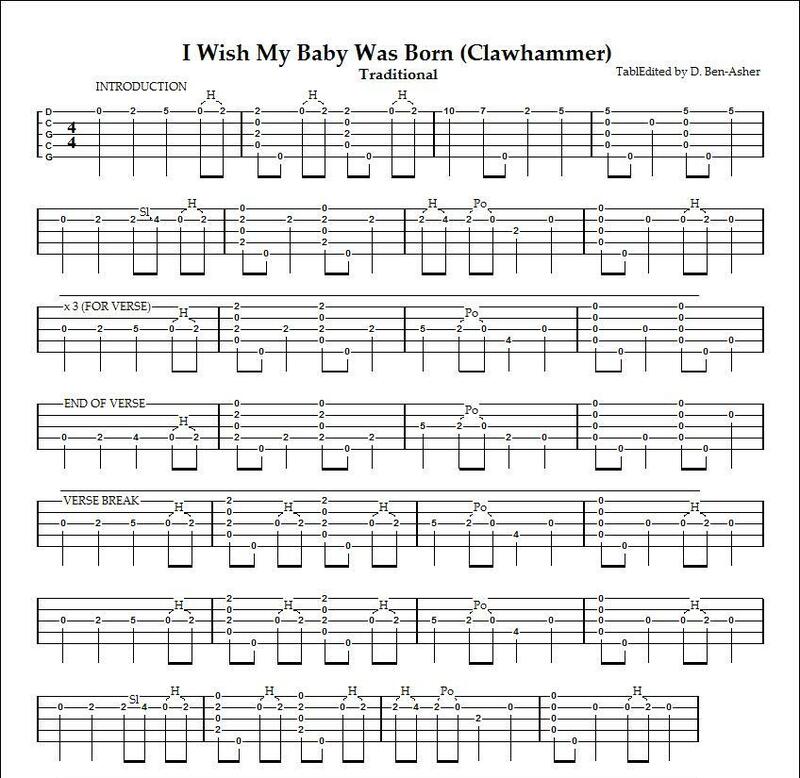 Notes: Beginner clawhammer version (with variations) of I Saw the Light (Hank Williams) with lyrics. The link has an embedded Tabedit file at the bottom obtained from a zip file from Phillip Mann's Bluegrassbanjo.org free site and is a variation to my simplified version with more hammer-ons and drop thumb playing. Notes: Johnny Cash used to vary the key while singing I Walk The Line. This is a basic version in G and you can try different barre chords if you want to change to other keys. Notes: I hope this is readable. I just wrote it out and photographed the tab on the kitchen table. The 5th string doesn't sound too good in the D section against the D chord, so I avoided it. If you want to add it, play it very softly. I'm not sure what 2 keys Johnny used, but it definitely needs a key change of some sort. The site will only allow me to put one key, but I've given you both G and D.
Notes: Pretty straightforward. The only comment I would make is that the 8th notes directly after the 8th rests should be played with the thumb (i.e. drop thumb). All the other notes follow the basic bum-ditty intuition in terms of forefinger and thumb use. Notes: I Wish You Knew is a classic by Jim and Jesse and the Virginia Boys, with a stellar banjo break by the great Allen Shelton. The break contains ones of Shelton's signature licks, in measure 13, and it illustrates his renowned bouncy style, as can be seen in measures 4 through 7. If you listen to the original recording by Jim and Jesse, you will hear lots of Shelton's tasty backup, including licks influenced by the pedal steel, which also show up in Bill Keith's playing. Jim and Jesse recorded it in the key of B, and so my tab is in B. Notes: This is my interpretation of Don Stover's version of I Wonder How the Old Folks Are at Home, which he recorded with the Lilly Brothers. It reveals many aspects of his bouncy/punchy style, including repeated pinches and hammer-ons in the C (IV) chord. Compare Stover's break to Bill Keith's, which I have also posted in the Tab Archive. Notes: Bill Monroe often had Del McCoury sing I Wonder How the Old Folks Are at Home when McCoury was Monroe's lead singer and guitarist, in 1963. Of relevance to BHO, Bill Keith was the banjo player of the day in the Blue Grass Boys. Several concert recordings of Keith's version with Monroe are floating around, and I have combined 2 of his breaks to give you a feel for his approach to the tune. Pay particular attention to measures 14 through 17, where Keith dishes out a tasty melodic take on the A (II) to D (V) chords, a section that alone is worth the price of admission. Notes: During the discussion in summer 2009 about whether it really was Earl playing on the radio recording of "I'll Fly Away" that was posted on BHO, one BHO member suggested that the rest of us post our versions of the song. 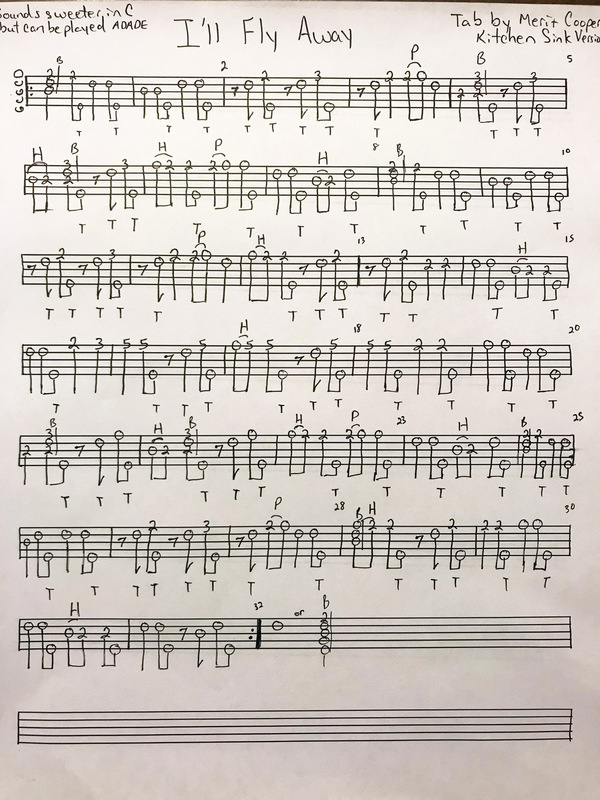 Being a cooperative person, I posted a recent version of mine, and this is the tablature for it, more or less. My version incorporates a little bit of a salute to the mystery player we have all agonized about -- and if you saw the video of Earl playing "I'll Fly Away" at Nat Winston's, you will probably agree that the mystery player on the tape is indeed Earl Scruggs. Also, near the end, it includes a tip of the hat to Bill Keith. Notes: Here's a fun, kinda intermediate, version of I'll Fly Away that takes a couple of twists and turns to keep everything interesting. Notes: The old O, Brother Where art thou classic (that's where I learned it from anyway!) Thought I'd post it in Old-D (Double C Capo'd 2) as we'd had some forum discussion about this song and that's how I play it. Notes: I arranged this for the beginner/intermediate player. There are a few drop thumbs, but nothing tricky. Enjoy. Notes: This tab is for the mp3 of I'll Fly Away posted on the Banjo Hangout by RB3Banjo This was a fragment with part of the tune followed by a fiddle break and then the whole tune. I have tabbed it as close as I can. If you refine the tab I would appreciate a copy. Notes: My attempt at "I'll Fly Away" as played in the movie "Oh Brother, Where Art Thou". This tab is in Sawmill tuning (G Modal). I capo up 2 and play in the key of C (C Modal?) which puts it into the key of D Modal, if that makes any sense. 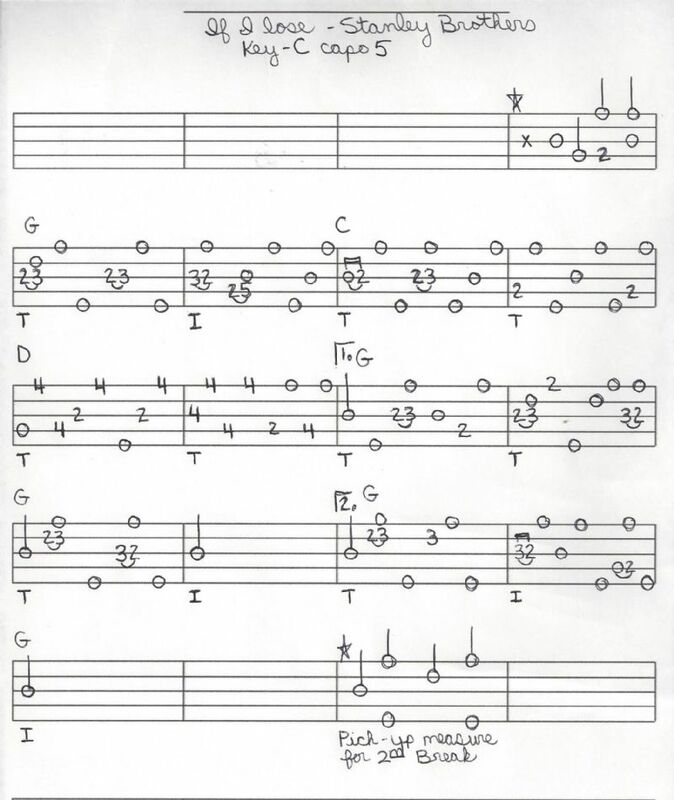 It's a simplified variation of the tab by David Marshall located @ http://www.hangoutstorage.com/banjohangout.org/storage/tabs/i/tab-ill-fly-away-11989-211438102009.jpg which he tabbed in Double C (Double D with capo). I've also included a link to the "Oh Brother" version in D that can be played along with to get the timing and melody, and added a page 2 for the measure pattern to play and the complete lyrics. I will attach this to the Gospel Lover's group and Beginner Clawhammer group. Notes: This is a three-finger arrangement resides somewhere in the ether between bluegrass and old-time. Notes: Someone requested my version of this so I tabbed it exactly as I play it. My Kitchen Sink Version. I have videos of playing this in D but found it easier to sing with in C. This version has a little syncopated sound that starts in measure 3. Once I started playing it like that, it has stuck. Enjoy! - I have no idea why the pdf gets turned sideways during upload. Flip it back. So sorry. Notes: This is one of Jim and Jesse's gems, recorded in the late 1950s, as far as I can tell, with Bobby Thompson on banjo. Thompson's break is straightforward and driving. My version is similar to his, although I have added a few embellishments, including the chorus. Notes: The first break is close to Earl Scruggs's classic recording. The next two breaks are variations that give some idea of how one can improvise around the melody. Notes: Here is a gem from the Flatt and Scruggs canon. Several different banjo players have recorded excellent versions, including Earl Scruggs, Bill Keith, and J. D. Crowe. The tab is my version and comprises two breaks. The first break is down the neck and is the melody of the verse, which is the standard way of playing the song. The second break starts out up the neck, with the melody of the verse, and then goes down the neck for the melody of the chorus. I first worked this version out in the 1970s and still play it this way. I guess I am not very imaginative. Notes: A traditional Irish tune. The tab isn't difficult and lays out well in Scruggs style. Notes: I'm A Believer, written by Neil Diamond, performed by The Monkees. Banjo arrangement by me. Notes: "The Yankee Doodle Boy", also well-known as "(I'm a) Yankee Doodle Dandy" is a patriotic song from the Broadway musical Little Johnny Jones written by George M. Cohan. The play opened at the Liberty Theater on November 7, 1904. Notes: With apologies to Bing! Notes: A Bill Monroe classic, recorded when Earl Scruggs with in the band. I wonder whether Monroe had this in mind as a vehicle for Earl's "fancy banjo" when he wrote the tune. I have tabbed out two breaks. The first sticks close to the melody, although I did throw in a little melodic sequence at the end. The second break is more out there and includes a high part that I really like, as well as an ending that you may find useful in other songs. Notes: This is a great old tune by Reno and Smiley. I have tabbed out two up-the-neck breaks. The first sticks pretty close to the melody; the second departs a bit and includes some licks that you might find useful in a variety of tunes. If you go to the Music section on my BHO web page, you will find a track of this song, from a practice tape by my band Silver Spring, recorded in Vancouver, B.C., in the mid-1970s. The second break in the tablature is the one on the track. On the recording, we played in A; so just capo up 2 and play it as tabbed in G. Note that the last D chord is a bit tricky, because it involves alternating the index and middle fingers while picking the first string. Although difficult, the lick is worth mastering, because you can use it in lots of tunes. The melody in the lick is played on the first string and involves a descending melodic sequence (D --> C --> B --> A --> G) embedded in a repetitive rhythmic pattern, as follows, with the melody string IN CAPITALS: ONE--three--two--one--ONE--three--two-one---ONE-three--two--one, and so on. Notes: Bill Monroe wrote this "true" song about revisiting his childhood home on Jerusalem Ridge in Kentucky. It is a good song for the banjo, and I have tabbed 3 breaks. The first stays close to the melody, and the others improvise a bit. 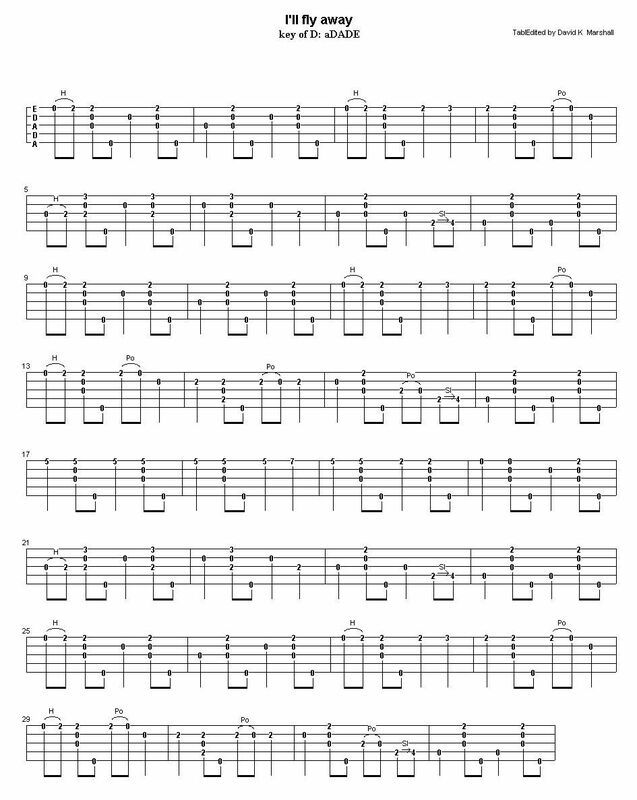 Notes: Basic "I'm Shipping Up to Boston" tab arranged for Open G tuned 5-string Banjo from guitar tablature (found on Ultimate-Guitar.com). This tab is well suited for Don Reno Style (aka Single String Style) picking, but will need more work to get it to Melodic or Scruggs style picking patterns. Notes: This tab is more or less the basic break as played by Don Reno on Don Reno, Founding Father of the Bluegrass Banjo, CMH-Records, 2001. Originally the tune appears in the key of A. I am using a capo on the second fret and I am aware the fact, that Don Reno didn't. However: The best way to figure out a tune is to play along with the record. Notes: Here are several of my breaks for a wonderful bluegrass tune that I first heard played by Earl Taylor and the Stoney Mountain Boys. I'm surprised that it has not been recorded by more bluegrass groups. The arrangement includes some D licks and some tags that you might find useful for other tunes as well. Notes: A traditional soldier's lament widely used by the German and Austrian military for military funerals and other ceremonies since 1825. The lyrics were written by Ludwig Uhland (1787-1862) and put to music by Friedrich Silcher (1789-1860), who based the melody on an old Swiss folk song. Thanks to drifter (Chris) for corrections! Notes: This is a nice little tune that's easy to learn. Notes: The tuning choices don't give the actual tuning which is aDAde. Notes: Traditional Shetland fiddle tune. Sawmill tuning EDAEa. You could make out an argument for this tune being in G, D or A! Double tonic in G and A is probably the best description. Notes: A famous German Christmas song that works well with the forward roll. Notes: Played in key of F out of standard G tuning. Stay off the 5th string! Notes: An exercise to help beginners with some melodic up the neck playing. Notes: I don't remember where I got this from, but it was arranged by Hugh Willingham. Notes: From Kenny Baker's father, Thaddeus Baker of Jenkins, Kentucky. It's heard on Kenny's Master Fiddler recording. Notes: This is a difficult tune in some ways, it was really not easy at all to force it into Tab. It may or may not be crooked in the traditional sense but it's crooked on the inside. I expect this tune will be very difficult to understand without hearing it played. Good luck.